From the earliest days of humans putting to sea in ships, there has been a need to "anchor" a vessel to the bottom. The first anchors were simply large stones. However, the need for a lighter, more efficient securing device quickly became essential. Mechanical devices with "teeth" that could dig into the bottom of the sea and be easily retrieved by the ship's crew for reuse were soon standard equipment aboard all vessels. The anchor on exhibit here is a fluke-style or "Danforth" anchor. American Richard Danforth invented the Danforth pattern in the 1940s for use aboard landing craft. It uses a stock at the crown to which two large flat triangular flukes are attached. The stock is hinged so the flukes can orient toward the bottom. Tripping palms at the crown act to tip the flukes into the seabed. The design is a burying variety, and once well set can develop high resistance. Its lightweight and compact flat design make it easy to retrieve and relatively easy to store. You'll note that the flukes (the large flat teeth) of this particular anchor have been widened to increase its holding power once set into the seabed. by the casting marks on the shank, this anchor originally weighed 5,000 lbs. The additional steel added to the flukes has made it even heavier. The casting marks also indicate that it was manufactured in Chester, Pennsylvania by the Baldt Corporation in 1955 for the U.S. Navy. 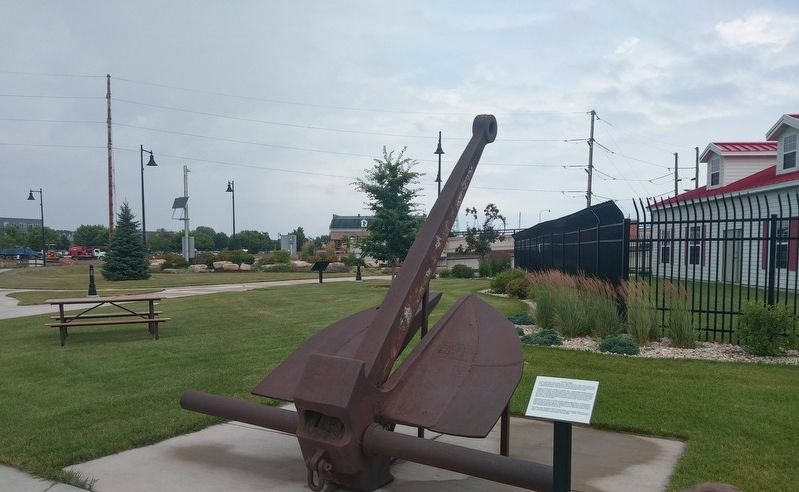 Baldt is a famous name in the realm of anchor design and manufacturing and from 1901 until 1975 was one of the world's largest producers of marine anchors. Thousands of Baldt anchors are still in service. Location. 44° 49.734′ N, 87° 22.874′ W. Marker is in Sturgeon Bay, Wisconsin, in Door County. Marker can be reached from South Neenah Avenue. Touch for map. Marker is at or near this postal address: Sawyer Park, S. Neenah Ave., Sturgeon Bay WI 54235, United States of America. Touch for directions. Other nearby markers. At least 8 other markers are within walking distance of this marker. 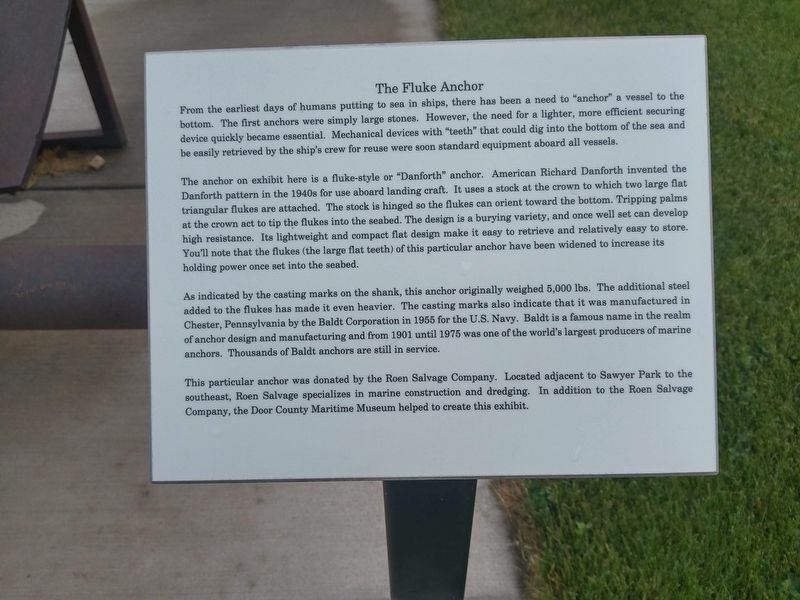 Sturgeon Bay's Waterfront History (here, next to this marker); a different marker also named Sturgeon Bay's Waterfront History (within shouting distance of this marker); Ship Propellers (within shouting distance of this marker); a different marker also named Sturgeon Bay's Waterfront History (within shouting distance of this marker); a different marker also named Sturgeon Bay's Waterfront History (within shouting distance of this marker); a different marker also named Sturgeon Bay's Waterfront History (within shouting distance of this marker); Buoy and Sinker (within shouting distance of this marker); a different marker also named Sturgeon Bay's Waterfront History (within shouting distance of this marker). Touch for a list and map of all markers in Sturgeon Bay. More. Search the internet for The Fluke Anchor. Credits. This page was last revised on March 29, 2019. This page originally submitted on March 27, 2019, by Devon Polzar of Port Washington, Wisconsin. This page has been viewed 44 times since then. Photos: 1, 2. submitted on March 27, 2019, by Devon Polzar of Port Washington, Wisconsin. • Bill Pfingsten was the editor who published this page.